Inspiring ways to display these or similar items such as Stilettos and Crochet hooks. Recreating a 17th-century embroidered jacket based on examples in the Victoria and Albert Museum, The Embroiderers' Story chronicles its progress. Wonderful video tour of IMCA Sewing Machine Museum, Holland. The opening view of a Lion is the figural sewing machine on the front cover of Oldtimer- Sewing Machine by Otto Landgraf - you'll see more of it in the video. 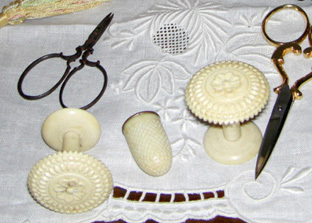 www.sewantiques.co.uk Sylvie Collett’s site; author of Palais Royal Needlework Tools. www.hygra.com Antique Boxes and tea caddies; includes information on the site.